I read this yesterday and didn’t think much of it, then today read chapter 12, which contains the story of Mary anointing Jesus. I’d always assumed that this was referring back to something John had already told us, but he hadn’t yet mentioned it. 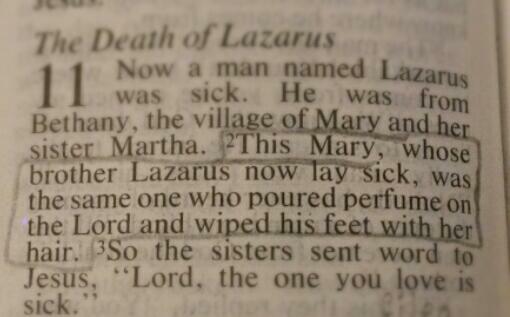 So if you were one of the book’s first readers, this would be very confusing – this is the same Mary who did what? What are you talking about? Unless, of course, what Jesus predicted in the Matthew and Mark accounts of the anointing story was already coming true: “Wherever this gospel is preached throughout the world, what she has done will also be told” (Matt 26:13). It seems that even within a few decades – before it had been written down anywhere – the story was already so well known that John felt it was a useful reference point to help orientate his readers within the story. I don’t know about you, but I find that amazing. I think that’s amazing too; just one woman’s actions, adoration, worship, sacrifice. It encourages me. Yes, it’s so weird to me that she was the only person he said that about, yet it was true – before the stories had been written down, John was confident that everyone knew that one. Amazing! It would be so useful if the writer’s always explained themselves like this with so many Marys and other identical names – particularly in the OT! But you’re right, it is a beautiful way to be remembered, something for us to aim for – what are we known for?